The Monroe County Local History Room and Museum has just added two new indexes and an update to its website. MCLHR.org now includes two dozen indexes! Is it time to search for your ancestors again? What's new? Visit www.MCLHR.org now to search your family names. The Civilian Conservation Corps program originally scheduled for tonight, Thursday, Feb. 7th, has been cancelled due to weather. We are hoping to reschedule the program for later this year. 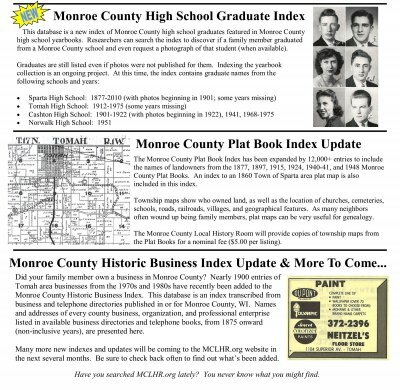 The Monroe County Local History Room has just added a new index and several updates to its website. Is it time to search for your ancestors again? Please see the attached document for details or head on over to www.MCLHR.org to start your search. It's not too late! 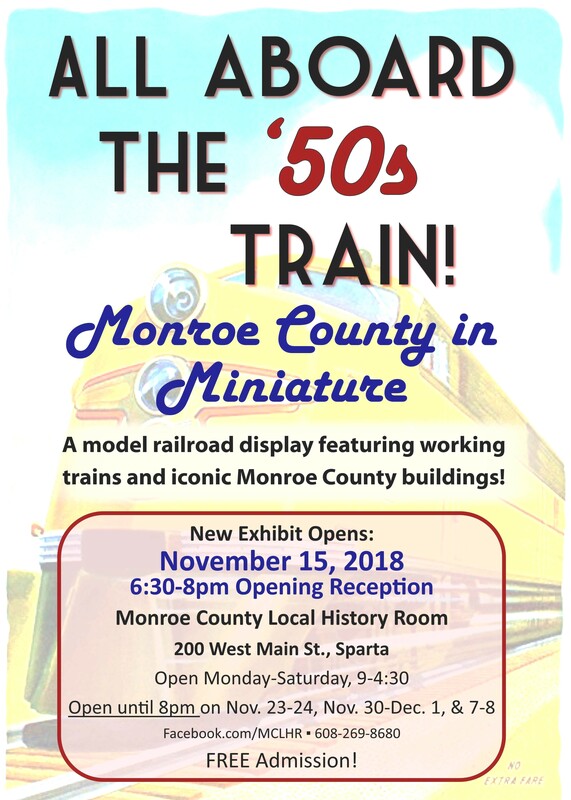 "All Aboard the 50s Train: Monroe County in Miniature" exhibit is still on view and will be throughout 2019. Come see the History Room's latest display-a model railroad featuring two operating trains and iconic Monroe County buildings reproduced in miniature. The Monroe County Local History Room is located at 200 West Main Street, Sparta. Regular museum hours are Monday-Saturday, 9-4:30. Admission is free. For more information visit www.facebook.com/mclhr or call 608-269-8680. 6th Annual Winter Break Craft Day at the Museums: Thursday, December 27th, 10am-1pm, come and go. Get out of the house and have some indoor fun at the Monroe County Local History Room and Deke Slayton and Bicycle Museum. K-3rd grade suggested but ALL are welcome to make a variety of seasonally-themed crafts to take home. You bring the creativity; we’ll provide the art supplies—and the refreshments! Free admission to the Museums and for the craft activities. The museums are located at 200 West Main St., Sparta. For more info call: 608-269-0033 or visit www.facebook.com/mclhr. “All Aboard the '50s Train! 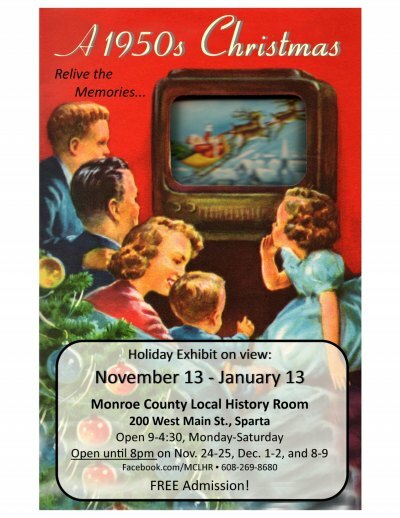 Monroe County in Miniature” exhibit opening reception, Thursday, November 15th, 6:30-8pm. Be the first to see the History Room’s latest display—a model railroad featuring two operating trains and iconic Monroe County buildings reproduced in miniature—especially from the Sparta, Tomah, Tunnel City, and Camp McCoy areas. The Monroe County Local History Room is located at 200 West Main Street, Sparta. Regular museum hours are Monday-Saturday, 9-4:30. The History Room will also be open until 8pm on Nov. 23-24, Nov. 30-Dec. 1, and Dec. 7-8. For more information call 608-269-8680 or visit Facebook.com/MCLHR. Admission is free; refreshments will be served. The Monroe County Biographical and Family History Index has grown by approximately 4,000 entries. Have you searched MCLHR.org lately? You never know what you might find. On Saturday, August 25th the Wegner Grotto County Park will host “Art Outdoors.” Family-friendly event includes exploring one of Wisconsin’s fascinating art environments, the Wegner Grotto, and creating art in the out-doors. Three art activities will be available to visitors: outdoor painting, clay sculpting, and mosaic making. Come and go from 9am-3pm. Instructors will be on hand. All skill and age levels are encouraged to attend. There is no fee for this event, but a $1.00 per person donation is greatly appreciated to defray programming costs. Lunch will be available to purchase on site. The Wegner Grotto County Park is located at 7788 Daylight Road, Sparta, Wisconsin. 15 minutes north of Sparta off Hwy 27, west on Hwy 71, south of the town of Cataract. For more information visit www.facebook.com/mclhr or call 608-269-8680. 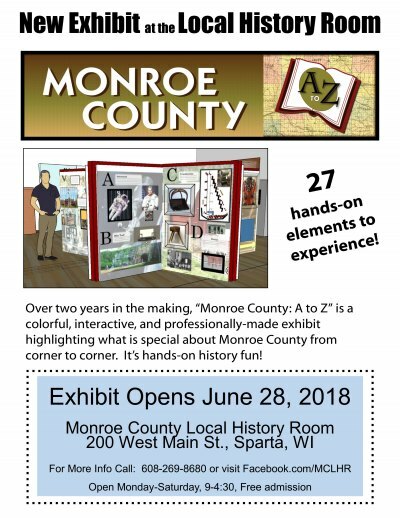 On June 28th, 2018, the History Room will be premiering a new, core exhibit called “Monroe County A to Z.” The theme of “Monroe County A to Z” is that of a colorful, alphabet history pop-up book which will highlight what is special about Monroe County from corner to corner. Each letter of the alphabet will represent a place, person, or event that is remarkable about the county. For example, “A” for Astronaut Deke Slayton, “B” for Bike Trail, “C” for Cranberries, all the way through to “Z” for the “zzzt, zzzt” of the saw blade that was once commonly heard in the northwestern corner of the county during the lumbering era of the 1800s. 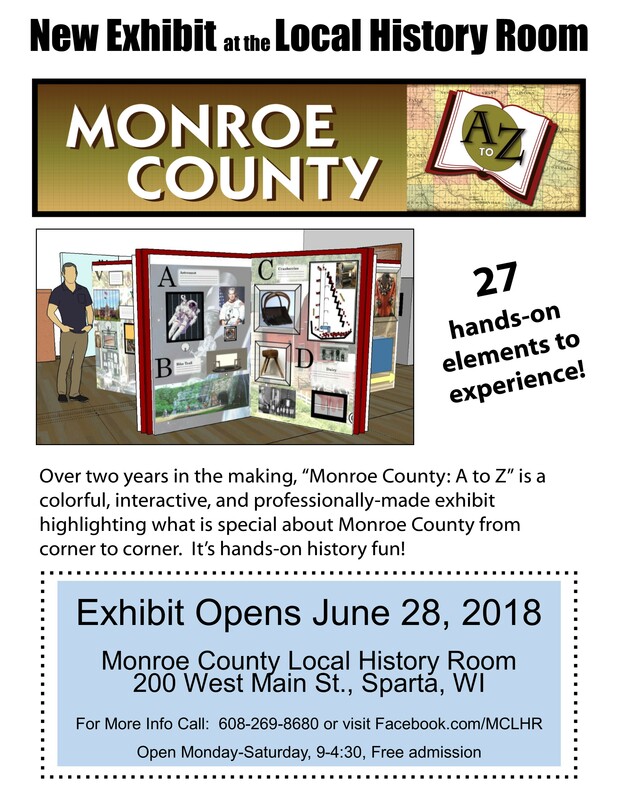 “Monroe County: A to Z” will be available to the general public to view starting June 28th during the History Room’s normal hours of operation: 9-4:30, Monday through Saturday. Admission is free. For more information visit www.Facebook.com/MCLHR or www.MCLHR.org or call 608-269-8680. MCLHR.org website indexes just updated! The Monroe County Local History Room has just updated two popular indexes on its website! Is it time to search your ancestors again? **The Monroe County Newspaper Index has grown by approximately 7,200 entries. Volunteers have been pulling names and dates out of issues of the Monroe County Democrat, Tomah Journal, and Kendall Keystone. There are now more than 309,000 newspaper articles abstracted from Monroe County newspapers from the 1850s to 1960s. The "Historic Image & Photo Archive" on the History Room website just grew by a 2,000 pictures! Be sure to search www.MCLHR.org thoroughly for historic images of Monroe County people, cities, villages, events, buildings, landmarks, businesses, disasters, homes, schools, and so much more. Just plug in the name or search term in the "Keywords" box. High-quality prints are available to order, starting at just $3.00. The Monroe County Local History Room online genealogy index keeps growing! Just added were 13,000 names indexed from Monroe County Rural School Student Records. These records can be useful tools to learn an individual's birth date, residence, siblings, schools attended, and parent or guardian when otherwise not available. Individual Student Records were compiled for rural school students born between approximately 1928 and 1956. While not complete for every record, the information recorded may include student name, date of birth, place of birth, parent name and occupation, nationality of parents, address, student grades, class year (for 8th grade graduation), schools attended and when, and teachers' names (see example image, below). The Monroe County Local History Room will provide a copy of the School Census or Student Record page listing the information of a given individual for a nominal fee ($5.00 per record). Simply click on "Get Copy of Record" and the name of the person for whom you are requesting a School Census or Student Record will be added to the "shopping cart." In the summer of 2017, archaeologists completed an extensive excavation at an eroding stream bank on Fort McCoy. The artifacts they unearthed, including arrowheads, pottery, and beads, reveal a wealth of scientific information about 3000 years of human activity in Monroe County. 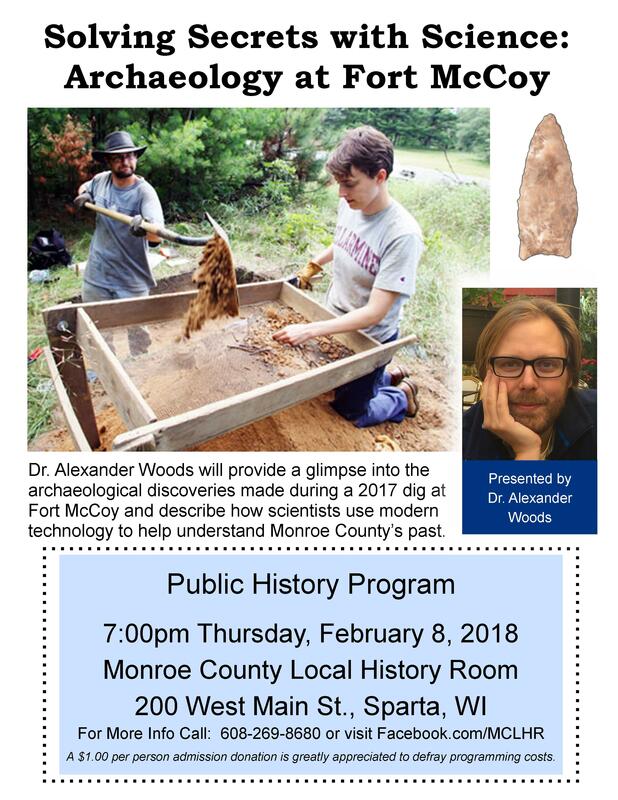 At 7pm on Thursday, February 8th at the Monroe County Local History Room, Sparta, Colorado State University's Dr. Alexander Woods will go beyond the artifacts, putting into focus the science and technology that goes into archaeological analysis both in the field and in the laboratory. 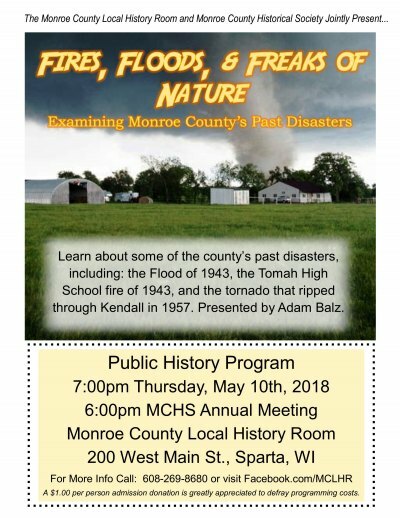 This 45 minute presentation will reveal how scientists use modern technology to help understand Monroe County's past. Also opening that evening is an exhibit curated by the Fort McCoy archaeological team featuring the artifacts discovered during their excavations. The archaeology exhibit will be on view through Summer 2018. The February 8th archaeology program begins at 7pm. The Monroe County Local History Room is located at 200 Main St., Sparta. A $1.00 admission donation appreciated. For more info visit: www.Facebook.com/mclhr. 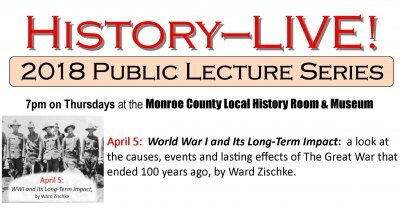 The Monroe County Local History Room is pleased to announce the lineup of its 2018 “History-Live!” Public Lecture Series. With topics ranging from archaeology to World War I, from past county disasters to regional hops growing, there is sure to be a program for everyone. 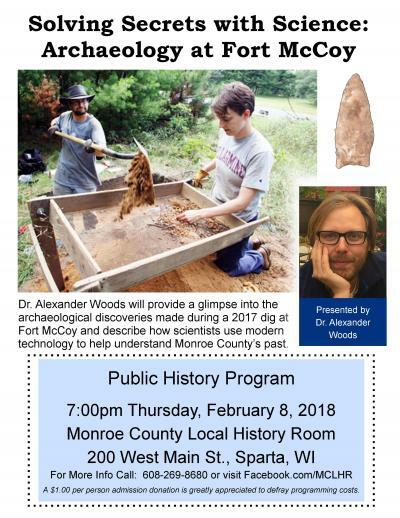 The first program, February 8, will be Solving Secrets with Science: Archaeology at Fort McCoy, a glimpse into the discoveries made at Fort McCoy digs in 2017 by Dr. Alexander Woods. It will be followed March 8 by Regional Hops Growing: Then & Now by Craig Saxe and Bob & Jim Conant of Bohica Hops Farm. This program will give an overview of hops growing in the area, past and present. 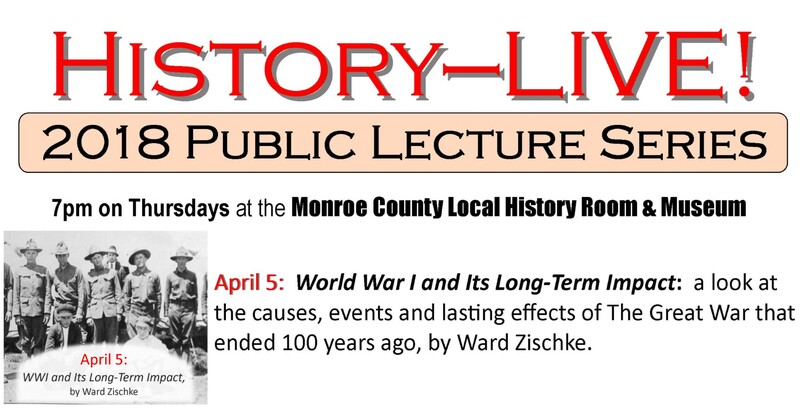 The April 5 program will feature Ward Zischke providing a look at the causes, events and lasting effects of World War I in World War I and Its Long-Term Impact. 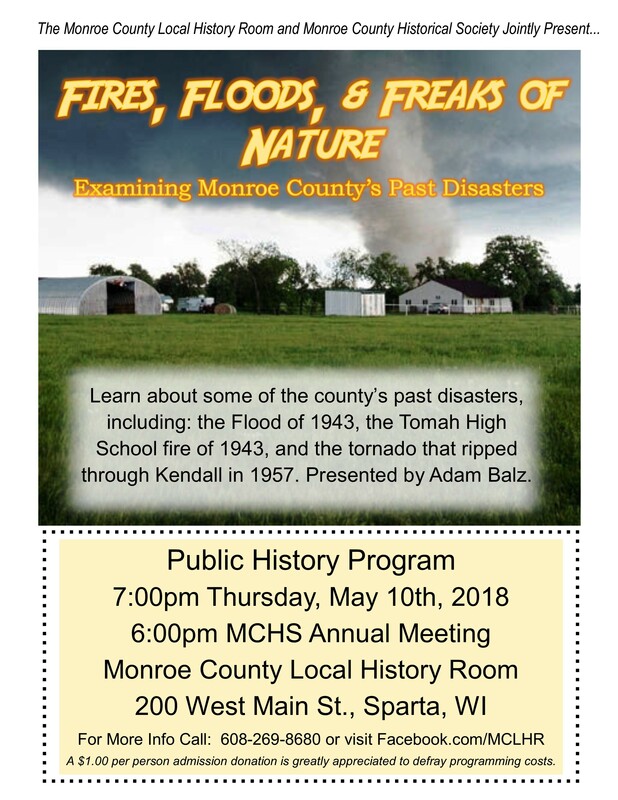 Lastly, the May 10 program will be Fires, Floods, and Freaks of Nature: Monroe County Disasters in which Jarrod Roll will share stories and photos from some of the county’s past disasters, including: The Flood of 1943, the Tomah High school fire, and the tornado that ripped through Kendall in 1957. All lectures will be held Thursdays at 7pm at the Monroe County Local History Room & Museum, 200 West Main St., Sparta. A $1.00 per person admission donation is greatly appreciated to help defray programming costs. For more info on these events call 608-269-8680 or visit www.Facebook.com/MCLHR. As you may have already heard, the Local History Room is planning to unveil a new and exciting, long-term exhibit later this spring. It’s called “Monroe County: A to Z”. We’re planning it to be a fun, interactive exhibit that will highlight what is special about Monroe County from corner to corner. It is also our most ambitious exhibit, to say the least. In order to better facilitate the development and creation of the exhibit, the Local History Room WILL BE CLOSED to the public from Monday, January 15th through Friday, January 19th. This week is being specially dedicated to activities directly related to the fabrication of the exhibit, both on and off site. LHR will return to its normal hours on Saturday, January 20th. We are excited for all of the great things coming in 2018! 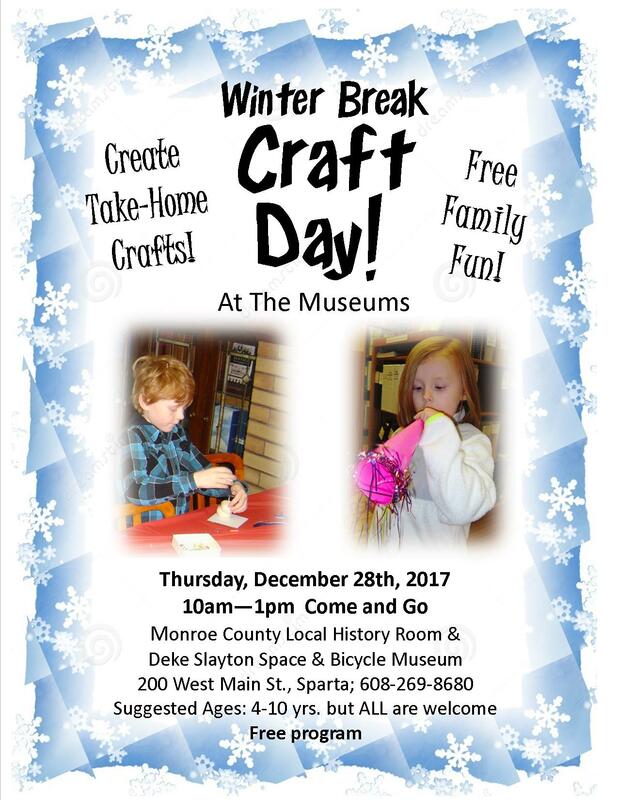 Get out of the house and have some indoor fun at the Monroe County Local History Room and Deke Slayton Museum on Thursday, December 28th, from 10am-1pm, come and go. K-3rd grade suggested but ALL are welcome. Create “Paper Plate Arctic Foxes,” “Styro Snowy Owls,” “Gingerbread Persons,” “Penguins,” and “Snowperson Masks.” You bring the creativity; we’ll provide the art supplies—and the refreshments! Free admission to the Museums and for the craft activities. The museums are located at 200 West Main St., Sparta. For more info call: 608-269-8680 or visit www.facebook.com/mclhr. LHR will be closed on 11/23, Thanksgiving Day, but will be open Fri. 11/24 and Sat. 11/25 9-8pm. Normal hours are 9-4:30, Mon-Sat. Santa and Mrs. Claus will be visiting the Monroe County Local History Room on Saturday, December 2, from 1:00-3:00pm. During that time, children will be invited to sit on Santa’s lap and have their photos taken with him. The event is being held in conjunction with the “1950s Christmas” display currently on exhibit at the Local History Room. This retro holiday display recreates what Christmas morning might have looked like sixty years ago, highlighted with dozens of classic toys under the tree. Museum and event admission is free. The Local History Room is located at 200 W. Main Street in Sparta. Regular museum hours are Monday-Saturday, 9-4:30. It will also be open until 8pm on November 24-25, December 1-2, and 8-9. For more information call 608-269-8680 or visit Facebook.com/MCLHR. It’s beginning to look a lot like Christmas – of the 1950s – at the Monroe County Local History Room in Sparta. Starting Monday, November 13th, visitors can time travel to the not-so-distant past by viewing the History Room’s special Christmas display, “A 1950s Christmas.” This retro holiday display recreates what Christmas morning might have looked like sixty years ago, from the classic toys under the tree to the linoleum flooring under the toys. Bask in the nostalgia as you view dozens of the most popular playthings of the 1950s on display right in front of your eyes. Time travel through television as you watch 60-year-old commercials on a 1953 TV. Get goosepimply as you page through Christmas catalogs from six decades ago. Bring the whole family and see what Christmas morning was like in the 1950s. The museum display, “A 1950s Christmas,” runs from November 13th through January 13th. The public is invited to a special open house on Monday, November 13th from 6:30-8pm. Enjoy a sneak preview of the display as well as sweet holiday treats. The Monroe County Local History Room is located at 200 West Main Street, Sparta. Regular museum hours are Monday-Saturday, 9-4:30. The History Room will also be open until 8pm on November 24-25, December 1-2, and December 8-9. For more information call 608-269-8680 or visit Facebook.com/MCLHR. Admission is free. --1-3pm "Fall Fest" on the Courthouse lawn, acrossed the street from the Museum Building. 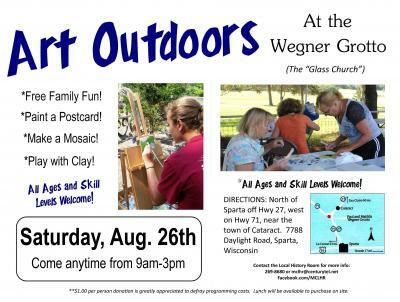 On Saturday, August 26th the Wegner Grotto County Park will host “Art Outdoors.” Family-friendly event includes exploring one of Wisconsin’s fascinating art environments, the Wegner Grotto, and creating art in the out-doors. Three art activities will be available to visitors: outdoor painting, clay sculpting, and mosaic making. Come and go from 9am-3pm. Instructors will be on hand. All skill and age levels are encouraged to attend. There is no fee for this event, but a $1.00 per person donation is greatly appreciated to defray programming costs. Lunch will be available to purchase on site. The Wegner Grotto County Park is located at 7788 Daylight Road, Sparta, Wisconsin. 15 minutes north of Sparta off Hwy 27, west on Hwy 71, south of the town of Cataract. For more information visit www.facebook.com/mclhr or call 608-269-8680. The Monroe County Local History Room has just added two new indexes and several updates to its award-winning genealogy and local history website, www.MonroeCountyHistory.org. One new index is the Monroe County Mortality Index. It is a database of names and accompanying information listed on mortality schedules from the 1860, 1870, and 1880 US Federal Censuses for Monroe County. A person was listed on a mortality schedule if he or she died within the previous year of when the census was taken (anytime between June 1 of the year prior to the census thru May 31 of the census year). Mortality schedule information may be useful as death records were not required by the State of Wisconsin until 1907. Besides name, residence, age, and date of death, additional information may include: place of birth, father and mother’s nativity, profession, cause of death, and number of days ill. The other new index to the website is the Monroe County Passport Application Index. This is an index of individuals who resided in Monroe County and applied for a U.S. Passport to travel abroad prior to 1925. Besides names, birthdates, residency and application date information, passport applications often contain additional information including: birthplace, immigration year when applicable, father’s name and birth information, places intending to travel to, physical description, and a photograph. Some individuals may have applied for a passport more than once. These records may be of particular interest for genealogists researching an immigrant ancestor who later returned to visit their home country. Besides the new indexes, updates have been made to the Monroe County Biographical Index to incorporate the personal war sketches of Civil War veterans who were part of the Grand Army of the Republic (GAR) Posts in Sparta and Tomah. Updates have also been made to the Monroe County Cemetery Index and Monroe County Church Records Index. Additionally, the Monroe County Newspaper Index has grown by approximately 15,000 entries for the Monroe County Democrat, Tomah Journal, Kendall Keystone, and Star-Herald News (Norwalk, Wilton area). There are now more than 300,000 newspaper articles abstracted from Monroe County newspapers from the 1850s to 1960s. There are now a half-million Monroe County names and keywords searchable through MonroeCountyHistory.org using 21 different search indexes, from newspaper articles to military records. Over 13,000 historic photographs are also available to view. 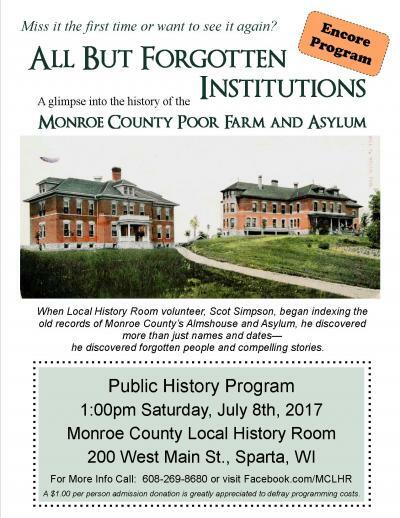 An encore presentation of Scot Simpson's “All But Forgotten Institutions: a glimpse into the history of the Monroe County Poor Farm and Asylum” will occur on Saturday, July 8, at 1 pm at the Monroe County Local History Room, 200 Main St., Sparta. We had such a good turnout back in February, we thought we'd have it again. Another round of genealogy classes at the Monroe County Local History Room will occur in March with “The Genealogist’s Toolkit Series: Making Ancestry.com Work for You.” Ancestry.com is one of the predominant websites for genealogical research today. Come on Saturdays in March to learn some tips, tricks, and tools of the trade to make Ancestry.com work for you. The schedule of programs will include: Searching Records on Ancesty.com (March 11), The Dos and Don’ts of Ancestry Family Trees (March 18), and Diving Deeper: Ancestry DNA and Other Extras (March 25). The Local History Room does have Ancestry.com for patrons to use. All classes run from 10-11 am at the Monroe County Local History Room, 200 W. Main Street in Sparta. There is a $5 fee per class, payable at the door. Any experience level welcome. For more information, call the Local History Room at (608) 269-8680, e-mail monroecomsa@gmail.com, or visit www.Facebook.com/mclhr. 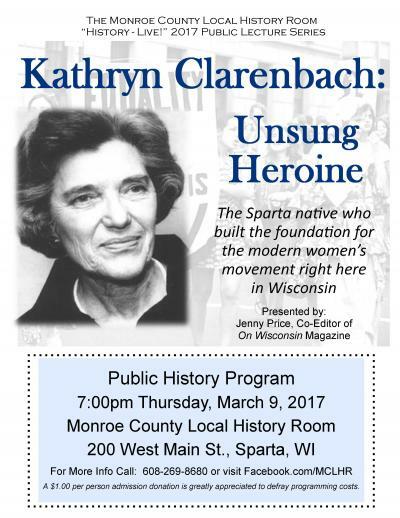 History Program Thursday, March 9, 7pm: "Kathryn Clarenbach, Unsung Heroine: The Sparta native who built the foundation for the modern women’s movement right here in Wisconsin," by Jenny Price. Monroe County Local History Room, 200 Main St., Sparta. $1.00 admission donation appreciated. For more info call: 608-269-8680 or visit: www.facebook.com/mclhr. Get out of the house and have some indoor fun at the Monroe County Local History Room and Deke Slayton Museum on Thursday, December 29th. From 10am-1pm, come and go. K-3rd grade suggested but ALL are welcome. Create “Paper Plate Snow Globes,” “Sun Catchers,” “Polar Bear Heads,” “Q-tip Snowflakes,” and “3-D Paper Houses.” You bring the creativity; we’ll provide the art supplies—and the refreshments! Free admission to the Museums and for the craft activities. The museums are located at 200 West Main St., Sparta. For more info call: 608-269-8680 or visit www.facebook.com/mclhr. 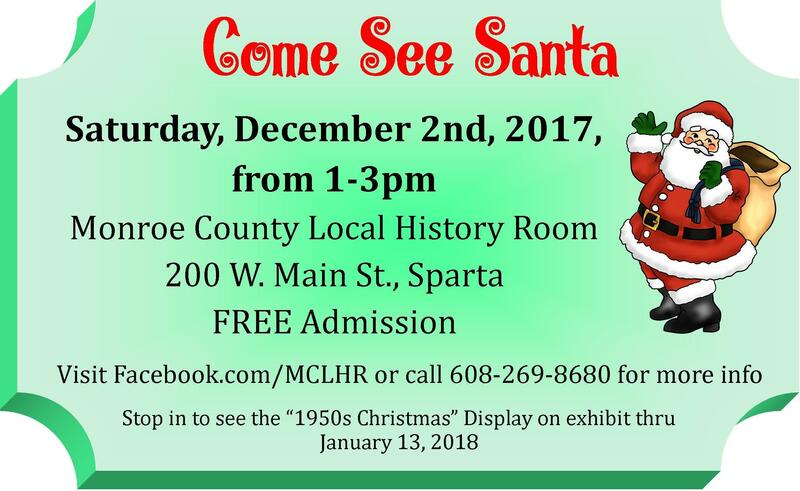 Santa and Mrs. Claus will be visiting the Monroe County Local History Room on Saturday, December 3, from 1:00-3:00pm. During that time, children will be invited to sit on Santa’s lap and have their photos taken with him. The event is being held in conjunction with the “Christmas Magic…In Miniature” North Pole Village display currently on exhibit at the Local History Room. The display features a collection of over 120 illuminated buildings depicting the magic, mystery, and childhood innocence of the North Pole. Museum and event admission is free. The Local History Room is located at 200 W. Main Street in Sparta. Regular museum hours are Monday-Saturday, 9-4:30. It will also be open until 8pm on November 25-26, December 2-3, and 9-10. For more information call 608-269-8680 or visit Facebook.com/MCLHR. See the North Pole come to life this holiday season with a new exhibit at the Monroe County Local History Room in Sparta. The “Christmas Magic…In Miniature” display features a collection of over 120 illuminated buildings depicting the magic, excitement, and childhood innocence of the North Pole. From the reindeer stables to the various candy stores and elf workshops, this enchanting and whimsical display embodies the wonder and joy of Christmas for visitors young and old. Kids will enjoy doing a “Scratch-n-Sniff Scavenger Hunt” as they visually explore this dazzling and playful Christmas village. An opening reception for the display, featuring refreshments and seasonal treats, will occur on Thursday, November 17, from 6:30pm-8:00pm. The miniature Christmas Village will be on display through January 14. Kids can visit Santa at the History Room on December 3rd from 1-3. Museum admission is free. The Local History Room is located at 200 W. Main Street in Sparta. Regular museum hours are Monday-Saturday, 9-4:30. It will also be open until 8pm on November 25-26, December 2-3, and December 9-10. For more information call 608-269-8680 or visit Facebook.com/MCLHR. The Monroe County Local History Room is excited to announce an upcoming workshop for church leaders and historians on “Using and Preserving Church Records.” The workshop is free and will be held Thursday, October 13, from 9:30-11:00 at the Monroe County Local History Room in Sparta, WI. Church records are a valuable but often overlooked resource for genealogists and congregational historians. The workshop will discuss why church records are so important and what information can be found in them. It will also offer some tips and tricks to help congregations better search within and preserve their records for future use. Space is limited so please RSVP early to 608-269-8680 to reserve your spot. Please call the Local History Room at 608-269-8680 with any questions or for more information. On Saturday, August 27th the Wegner Grotto County Park will host “Art Outdoors.” This free event includes exploring one of Wisconsin’s fascinating art environments, the Wegner Grotto, and creating art in the out-doors. Three art activities will be available to visitors: outdoor painting, clay sculpting, and mosaic making. . Come and go from 9am-3pm. Instructors will be on hand. All skill and age levels are encouraged to attend. The Wegner Grotto County Park is located at 7788 Daylight Road, Sparta, Wisconsin. 15 minutes north of Sparta off Hwy 27, west on Hwy 71, south of the town of Cataract. For more information visit www.facebook.com/mclhr or call 608-269-8680. The World War I Draft Registration Card Index has just been added to MCLHR.org. This database is an index of Monroe County males who registered for the draft during World War I. Researchers can now search the index to discover if a family member registered for the draft between 1917 and 1918. Shortly after the U. S. declared war on Germany during World War I, the Selective Service Act was passed on May 18, 1917, requiring every male living in the U. S. between the ages of 18 and 45 to register for the draft. While a large number of those who registered for the draft did not end up serving in the military, the records still contain valuable (and often overlooked) information for genealogists. Since the information on the Draft Registration Card was given directly by the individual in question, it is often more reliable than that found in censuses, obituaries, death records, and others whose information was provided second or third hand by a spouse or child. Not only does the World War I Draft Registration Card list basic information like name, age, birth date, and place of residence, but it will also include birthplace, citizenship status, occupation and employer, marital status, race, and dependent information. The birthplace listed can be of particular importance for finding out where a family came from. Additionally, a Draft Registration Card will provide the registrant’s signature, physical description, and disabilities when applicable. The description can be of particular interest when a photograph is lacking for an individual. Draft registrations taken later in 1917 and 1918 will also list the name and address of the nearest relative—often a parent or spouse—and some will include the father’s birthplace as well. Visit www.MCLHR.org and begin searching your ancestors! When Star Wars hit the movie theaters in 1977, it instantly became a box office smash, especially with children. Kids wanting to bring the action home from the theater with them could find their favorite heroes, villains, creatures and spaceships in miniature size on the toy shelves. From 1978 to 1985, Kenner Toys manufactured hundreds of action figures, vehicles, and playsets featured in the movies Star Wars, The Empire Strikes Back, and Return of the Jedi. These toys today are as iconic as the movies themselves. On view now is the largest public display of these original Kenner Star Wars toys ever in Wisconsin at the Monroe County Local History Room & Museum in Sparta. The Star Wars toys display will be on view during normal Local History Room hours, Monday through Saturday 9-4:30 through Summer 2016. Admission is free. The Local History Room is located at 200 West Main St., Sparta, Wisconsin. For more information contact 608-269-8680 or www.Facebook.com/MCLHR. History Program: The Stories Cemeteries Tell: Fairview Cemetery, Bangor: A Case Study, by Greg Wegner. Thursday, May 12th at 7pm. Monroe County Local History Room, 200 Main St., Sparta. Hear about the historical and genealogical discoveries made by Greg Wegner and his team of volunteers during their season-long restoration project at Fairview Cemetery, Bangor. $1.00 admission donation appreciated. For more info call: 608-269-8680 or visit: www.facebook.com/mclhr. History Program: The Norwegian Crop: Tobacco Raising in Wisconsin, by Glenn Borreson. Thursday, April 14th at 7pm. Monroe County Local History Room, 200 Main St., Sparta. Learn the history and heritage of this once important cash crop. Share your own stories of growing and harvesting this labor intensive agricultural product. $1.00 admission donation appreciated. For more info call: 608-269-8680 or visit: www.facebook.com/mclhr. History will again come alive at the Monroe County Local History Room on March 10 with the program “Cordelia Harvey: The Wisconsin Angel and Her State’s Impact During the Civil War” by Hannah Scholze. While portraying Cordelia Harvey, Scholze discusses the life and lasting influence of this remarkable Wisconsin Governor’s wife as well as the many important contributions made to the war effort by Wisconsin men and women alike. 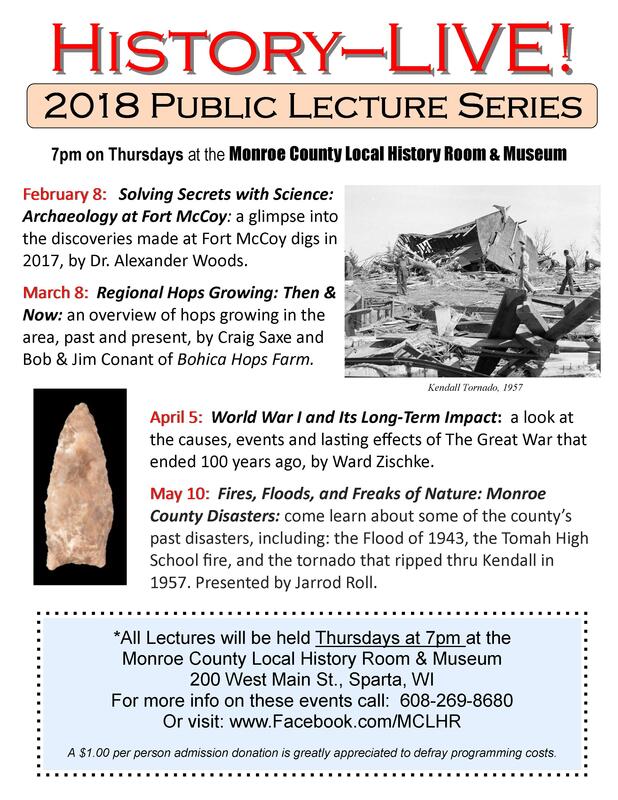 The program will run from 7-8 PM on Thursday, March 10, at the Monroe County Local History Room located at 200 W. Main Street in downtown Sparta. A $1 admission donation is appreciated. For more information, please call (608) 269-8680 or visit www.Facebook.com/mclhr. 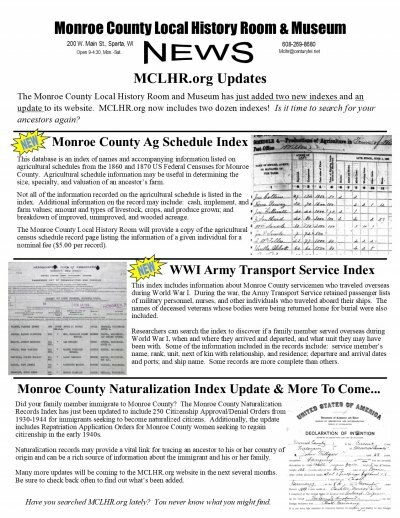 Index to Monroe County Deaths: 1907-1968 Now Available at www.mclhr.org! Need to learn the death date of an ancestor? Want to discover if a relative died in Monroe County between 1907 and 1968? You can now search an index of all deaths registered with the Monroe County Register of Deeds between 1907-1968. In the early 1900s, WI started requiring the reporting of all deaths. By 1907 the laws were strongly enforced and all Wisconsin counties mark this year as the start for a thorough accounting of the deaths. Special thanks to the Monroe-Juneau-Jackson Genealogical Workshop for creating and sharing this index with the Local History Room. Have you searched www.MCLHR.org lately? Free genealogy classes at History Room in Feb.
Free genealogy classes in February at the Monroe County Local History Room. “The Genealogist’s Toolkit Series: Old World to New World Collections.” The schedule of programs will include: Immigration Research 101 (February 6), Researching Ancestors from the U. K. (February 13), Researching Scandinavian Ancestors (February 20), and Researching German Ancestors (February 27). 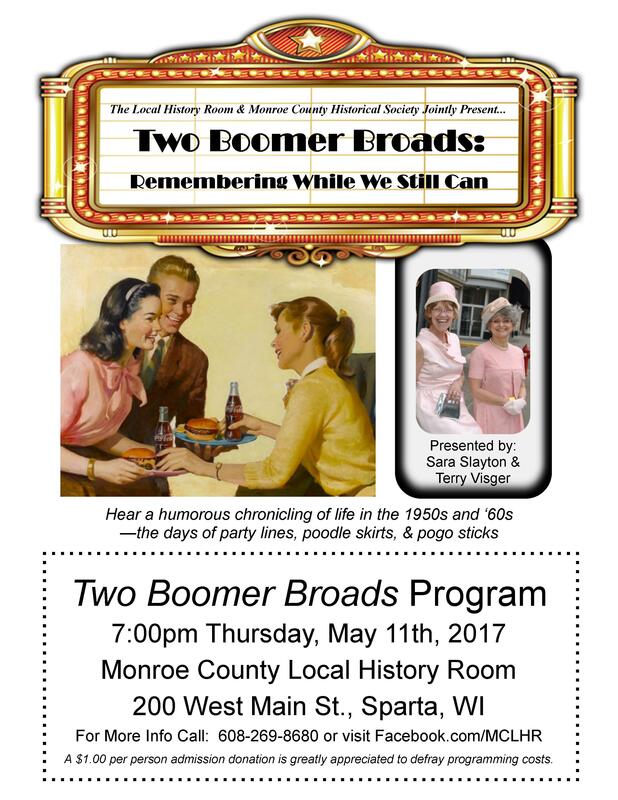 All presentations are free and will start at 10:00 AM at the Monroe County Local History Room located at 200 W. Main Street in Sparta. For more information, call the Local History Room at (608) 286-8680, e-mail monroecomsa@gmail.com, or visit www.Facebook.com/mclhr. History Program: "Indian Place Names in Wisconsin;” Feb. 11, 7pm. History Program: "Indian Place Names in Wisconsin,” presented by Bob Taunt. Thursday, February 11th at 7pm. Monroe County Local History Room, 200 Main St., Sparta. A colorful and entertaining presentation reviewing many of the state's unique and interesting place names. $1.00 admission donation appreciated. For more info call: 608-269-8680 or visit: www.facebook.com/mclhr. When Star Wars hit the movie theaters in 1977, it instantly became a box office smash, especially with children. Kids wanting to bring the action home from the theater with them could find their favorite heroes, villains, creatures and spaceships in miniature size on the toy shelves. From 1978 to 1985, Kenner Toys manufactured hundreds of action figures, vehicles, and playsets featured in the movies Star Wars, The Empire Strikes Back, and Return of the Jedi. These toys today are as iconic as the movies themselves. On view now is the largest public display of these original Kenner Star Wars toys ever in Wisconsin at the Monroe County Local History Room & Museum in Sparta. The Star Wars toys display will be on view during normal Local History Room hours, Monday through Friday 9-4:30 and Saturdays 10-4:30, from November 24 through Spring 2016. Admission is free. The Local History Room is located at 200 West Main St., Sparta, Wisconsin. For more information contact 608-269-8680 or www.Facebook.com/MCLHR. The "Historic Image & Photo Archive" on the History Room website just grew by a thousand pictures! Be sure to search www.MCLHR.org thoroughly for historic images of Monroe County people, cities, villages, events, buildings, landmarks, businesses, disasters, homes, schools, and so much more. Just plug in the name or search term in the "Keywords" box. High-quality prints are available to order, starting at only $3.00. The Monroe County Newspaper index has grown by 13,000 entries, including thousands more from the Cashton Record and Star Herald News (Norwalk, Wilton area). There are now more than 280,000 newspaper articles abstracted from Monroe County's newspapers from the 1850s to the 1960s. On Saturday, August 22nd the Wegner Grotto County Park, located 9 miles north of Sparta, will host a day of fun through art making. This event includes exploring one of Wisconsin’s fascinating art environments, the Wegner Grotto, and creating art in the out-doors. Two art activities will be available to visitors: outdoor painting and mosaic making. Visitors can learn to paint in the Plein-Air style on a postcard-size canvas. “Plein-Air” means “painting in the open air,” which in this case means painting pictures of the sculptures you see at the Wegner Grotto park. Visitors may also choose to make mosaics using materials similar to those used to create the Wegner Grotto sculptures. All ages are invited to participate in this free art program. Cash prizes will be awarded for all age levels and abilities creating Plein-Air paintings, from young children through professional adult artists. All art supplies will be provided but supplies will be limited. Visitors are invited to create art anytime between 9:00 am and 4:00 pm. Judging for the Plein Air painting event will take place from 4:00-5:00 pm. For beginners, there will be instruction on Plein Air painting and mosaic creation throughout the day. All skill and age levels are encouraged to make-and-take home their own painting or mosaic. This event will take place rain or shine, so come prepared. The Wegner Grotto County Park is located 15 minutes north of Sparta off Hwy 27, west on Hwy 71, south of the town of Cataract. The Grotto’s address is 7788 Daylight Road, Sparta, WI, 54656. Please contact Jarrod Roll, 608-269-8680 or mclhr@centurytel.net for additional information. 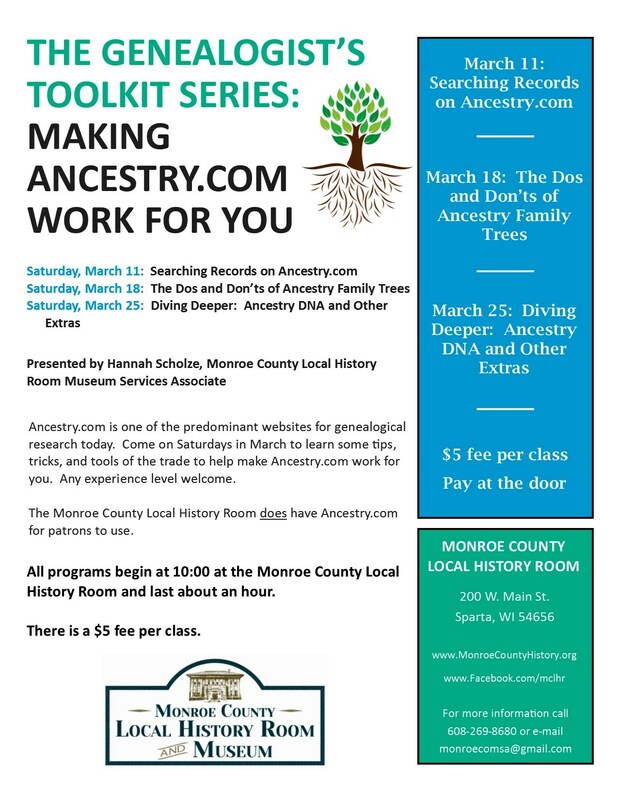 On Saturdays in September, Hannah Scholze, Monroe County Local History Room Museum Services Associate, will be presenting “The Genealogist’s Toolkit Series: High and Low-Tech Resources.” Whether you’re just a beginner of have been researching your family history for years, come to learn some tips, tricks, and tools of the trade. The schedule of programs will include: Searching with Ancestry.com (September 12), Family Tree Maker 101 (September 19), and Only in Monroe County: A Treasury of Local Collections (September 26). 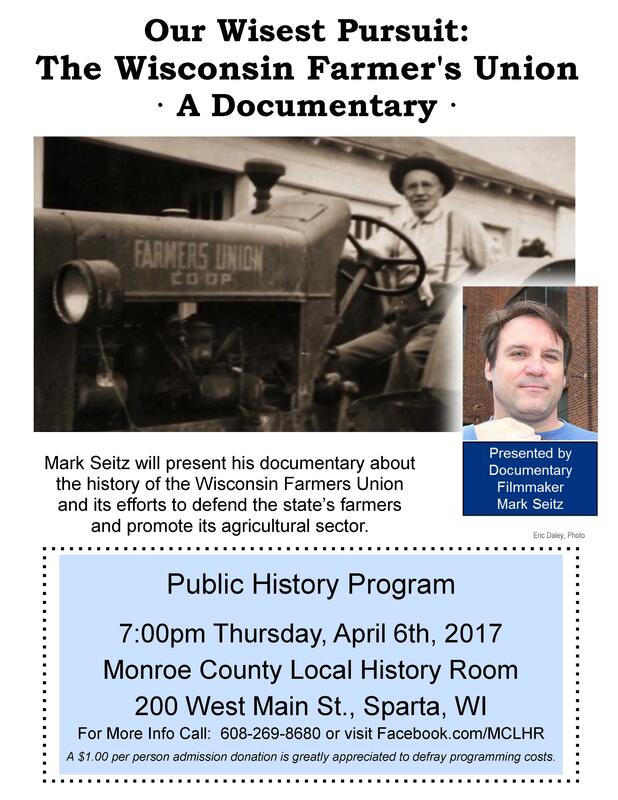 All presentations are free and will start at 10:00 AM at the Monroe County Local History Room located at 200 W. Main Street in Sparta. For more information, call the Local History Room at (608) 286-8680 or e-mail monroecomsa@gmail.com. Tuesday, May 5th, 7pm: Genealogy for the Beginner class at the Tomah Museum, 1112 Superior Ave., Tomah, WI. A free educational program to introduce you to the basics of researching your family history. Presented by the Monroe-Juneau-Jackson Genealogical Workshop and the Tomah Area Historical Society. There are over 12,000 historic pictures searchable through the Local History Room website, www.MCLHR.org. Sometimes the subjects of those images are unknown or incorrectly identified. The Local History Room just made a change that allows the public to suggest names and corrections to images found on www.MCLHR.org. Simply click on an image and scroll to the bottom of the page that opens up. There you will see, "Please click here to identify or correct someone or something in this photo." A box will open up where you can submit suggested names and/or corrections along with verification of how you know what you know about that image. The History Room staff will make the suggested corrections/additions if we agree that the info supplied seems correct. Together, we will make the Local History Room Historic Image Database even MORE useful. 7pm March 5th History Program - "Tart's Delight"
“Tart’s Delight: 19th Century La Crosse as seen through the eyes of Madam Frankie La Salle. ” A public history program presented by Kelly Kreig-Sigman. Thursday, March 5th, 7pm, Monroe County Local History Room, 200 Main St., Sparta. Join us for an entertaining AND educational presentation that includes historic facts and images of the world’s oldest profession and famous 19th century figures from La Crosse area history. Mature audiences suggested. $1.00 admission donation appreciated. For more info call: 608-269-8680. In 1974 the US Military began to allow women into units outside of the Women's Army Corps (WAC). According to the speakers, the integration of females into the regular armed forces was a new concept in the 1970s. On Thursday, February 5th at 7pm, the Monroe County Local History Room will present, “Woman As Citizen Soldier: The Assimilation of Females into the Army Reserve: 1974-75.” The presenters are Ward E. Zischke, Command Historian, 88th Regional Support Command, Fort McCoy, WI, and John Perry, Retired Army Reserve Major, who was directly involved with the assimilation process in the 1970s. According to Retired Army Reserve Maj. John A. Perry, a milestone in establishing gender equality within the Army Reserve was a groundbreaking initiative by the then 88th Army Reserve Command in 1974. It was then that a platoon of 30 female recruits was assembled to give visibility and help foster acceptance, incorporation and respect for the new wave of female warrior-citizens joining the ranks. Perry, who served on the staff of the 88th's commander at the time, will speak detail of the era and program at the program on Feb. 5th. 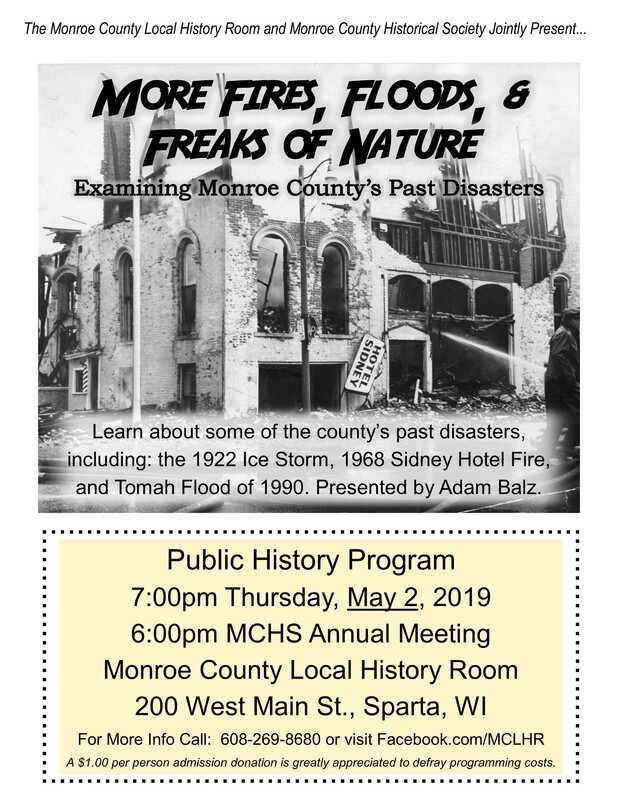 This program runs from 7-8pm at the Monroe County Local History Room, located at 200 West Main St. in downtown Sparta. Call 608-269-8680 for more information. There is no admission charge for the program, but a donation of $1.00 per individual is appreciated to help defray costs. Please call 608-269-8680 for more information. The Monroe County Newspaper index has grown by 12,000 entries, including thousands more from the Kendall Keystone and Tomah Journal. There are more than 260,000 newspaper articles abstracted from Monroe County's newspapers from the 1850s to the 1960s available to search on www.MCLHR.org. Thank you MCLHR volunteers for all of your indexing help! 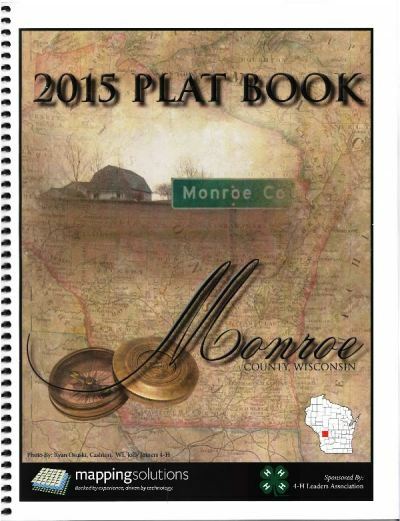 A useful tool for researchers, pick up a copy of the most recent Plat Book for Monroe County, WI. Relive Christmas morning— 1970s style – at the Monroe County Local History Room in Sparta. Starting Monday, November 17th, visitors can time travel to the not-so-distant past by viewing the History Room’s special Christmas display, “A Very 1970s Christmas.” This retro holiday display recreates what Christmas morning might have looked like forty years ago, from the toys under the tree to the shag carpeting under the toys. Bask in the nostalgia as you view dozens of the most popular playthings of the 1970s on display right in front of your eyes. Time travel through television as you watch 40 year old commercials on a 1970 color TV. Get goosepimply as you page through Christmas catalogs from four decades ago. Bring the whole family and show the kids what mom and dad got for Christmas when they were young. 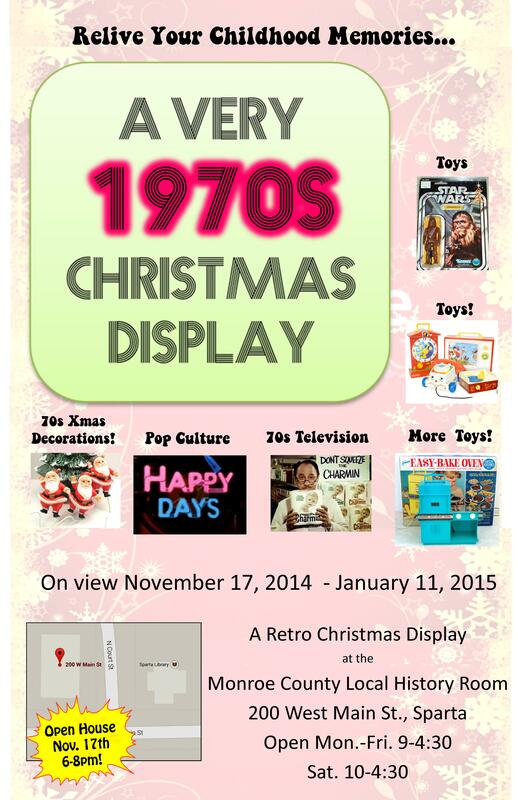 The museum display, “A Very 1970s Christmas,” runs from November 18th through January 10th. Free admission The Monroe County Local History Room is located at 200 West Main Street, Sparta. Hours are 9-4:30 Monday through Friday and 10-4:30 on Saturday. Please contact Jarrod Roll, 608-269-8680 for additional information. The video provides a guided tour of the site, its sculptures and history, as narrated by Norma Schmig, great granddaughter of Paul and Matilda Wegner. The Wegners constructed the grassroots arts site (now county park) beginning in 1929. See the spirits of early Warrens pioneers and learn about their lives at the 4th Annual Spirit Walk on Sunday, Sept. 7, at 1 p.m., at the Warren Mills Cemetery on Oakwood Avenue. You'll also meet a Civil War soldier, see a demonstration of witching rods and learn tips for properly cleaning headstones. The 90-minute program is presented by the Monroe County Historical Society and the Monroe County Local History Room. Donations are appreciated. Bring your lawn chair for an educational and entertaining afternoon. On August 2-3 the Wegner Grotto County Park, located 9 miles north of Sparta, will host a weekend of family fun through art making. The event includes exploring one of Wisconsin’s fascinating art environments and learning to paint in the Plein-Air style on a postcard-size canvas. All ages are invited to participate in this free art program. Cash prizes will be awarded for all age levels and abilities. All art supplies will be provided but supplies will be limited. The Plein Air Painting Event will begin at 8:00 am on Saturday, August 2nd and end at 4:00 pm on Sunday, August 3rd. For beginners, there will be instruction on Plein Air Painting by Dr. Bob Tarrell, Edgewood College Art Department, from 9am until 4pm Saturday August 2nd. All skill and age levels are encouraged to attend. Judging will take place from 4:00-5:00 pm on Sunday. Digital photos of all entries will be taken and photos of award winners will automatically be entered in the state competition with the winners from the other competition sites. Winners will have their works in an online exhibition on the Kohler Foundation website. All participants are invited to have their work on display at the Monroe County Local History Room & Museum, located at 200 West Main St., Sparta, throughout the month of August. The Wegner Grotto County Park is located 15 minutes north of Sparta off Hwy 27, west on Hwy 71, south of the town of Cataract. Please contact Jarrod Roll, 608-269-8680 or mclhr@centurytel.net for additional information. Vintage high school yearbooks from Sparta and Tomah, old city directories, Monroe Co. plat maps, rare county books and out of print community histories have been added to the gift shop. These are items that were donated to the Local History Room to sell because they duplicate items already i the LHR collection. 100% of gift shop sales support the LHR Research Library. in their own separate box and indexed. Company, the Pet Milk Company, hotels, stores, and farms. Attached to each permit may be a birth certificate, baptism certificate, physician certificate, a school certificate, or a parent’s statement to verify the birthdate of the child. The years of the permits range from 1924 to 1936. The "Historic Image & Photo Archive" on the Local History Room's website, www.MCLHR.org, grew by several thousand pictures. Be sure to search it thoroughly for historic images of Monroe County people, cities, villages, events, buildings, landmarks, businesses, disasters, homes, schools, and so much more. Just plug in the name or search term in the "Keywords" box. High-quality prints are available to order. A family rumor suggested that your Great Uncle lived at the Monroe County Farm. How do you confirm it? A new indexing project will make searching County Farm records much easier. The "Monroe County Farm" has referred to both the Monroe County Alms (Poor) House and the County Insane Asylum (Hospital). The Local History Room recently received County Farm records from another county office. LHR Volunteer, Scot S., has begun to index the records of inmates covering the years 1870s-1940s. The County Farm Records Index will go live on www.MCLHR.org when it is completed, sometime later this year. 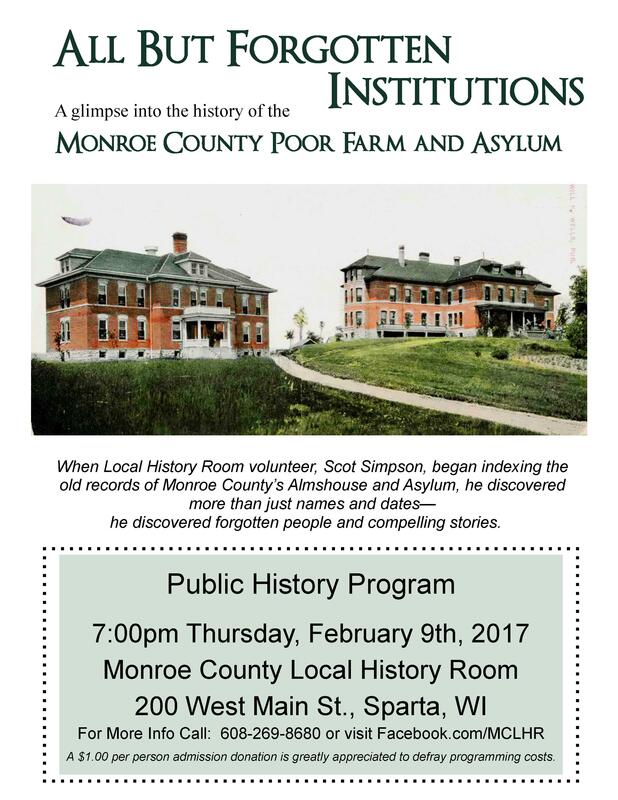 Those of you living within driving distance to Sparta, WI, are encouraged to attend the Local History Room's winter lecture series called "History-LIVE" for some interesting and engaging programs related to Monroe County history. A $1.00 per person admission donation is greatly appreciated to defray programming costs. The Monroe County Newspaper index has grown by 23,000 entries, including thousands more from the Tomah Journal, Cashton Record, and for the first time--Kendall Keystone. There are more than 250,000 newspaper articles abstracted from Monroe County's newspapers from the 1850s to the 1960s. Click HERE to search the index. *NEW* Church Records Index Now Available! Need a birth or death date for your ancestor? How about marriage information? You may find this and other vital data hidden in church records now availble to search using the NEW Church Records Index at www.MCLHR.org. Indexing county church records is an ongoing process; more church records from other county churches will be indexed and added to the website in the future. "Tug Hollow: A Wisconsin Community and Its One-Room School" by Nancy R. Schroeder and contributors is availble through MCLHR.org. "Tug Hollow" is a history of a one-room school near Oakdale, Monroe County, WI, and the community surrounding it. From the back cover: “The book is a factual account, with many anecdotes, about a valley of small farms in Wisconsin and the school that was so important to the people who lived there.” Dozens of historic black and white images. 316 pages. May 9: “A Post-Civil War Mortality View of Salisbury Prisoners from Wisconsin.” Researcher Ronald D. Nichols examines the experiences of Monroe County soldiers imprisoned in a South Carolina prison during the Civil War. 7pm. Monroe County Local History Room & Museum, 200 West Main St., Sparta, WI. For more info on these events call: 608-269-8680. A $1.00 per person admission donation is greatly appreciated to defray programming costs. The "Historic Image & Photo Archive" on the Local History Room's website grew by several thousand pictures. Be sure to search it thoroughly for historic images of Monroe County people, cities, villages, events, buildings, landmarks, businesses, disasters, homes, schools, and so much more. Just plug in the name or search term in the "Keywords" box. High-quality prints are available to order. Give the gift of peace of mind this holiday season. Purchase a Gravestone Cleaning Kit to ensure that your ancestors' grave markers are preserved for years to come. Clean your ancestor's gravestone the same way the professionals clean the Acropolis, the Alamo, and the Tomb of the Unknown Soldier! The Gravestone Cleaning Kit provides you everything you need to safely clean 1-2 gravestones. Give someone a gift AND honor your ancestors at the same time. Want to own an original copy of the 1897 Monroe County Atlas, a 1925 yearbook, or other out of print resources? Be sure to check the Monroe Co Local History Room Gift Shop for rare items for sale. Our Rare and Out of Print store features items donated to the LHR to sell as fundraisers when the items would otherwise duplicate superior examples already in the LHR collection. Money raised from the sale of these items directly support the Local History Room research library. Be sure to visit the Rare and Out of Print Store to obtain your own piece of Monroe County's past. Supplies are limited and inventory changes frequently. The Wisconsin Historical Society has named the Monroe County Local History Room and Museum in Sparta as one of two winners of the society's Governor's Award for Archival Achievement. Established in 1976, the Monroe County Local History Room and Museum operates a research library, archives and a collection of museum artifacts. In 2006, the organization engaged a website designer to create and host its website, and in 2007, the online resource was expanded to include 16 indexes containing more than half a million searchable entries. An independent panel of judges recommended the organization for the award, citing its excellent work and its entrepreneurial strategy in earning program revenue by delivering photocopies and reprints to patrons. The Local History Room is the first two-time winner of the State Archives Award, having been awarded the prestigious award in 2001. 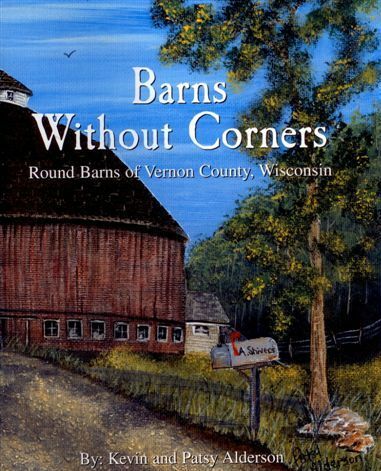 NEW: "Barns Without Corners: Round Barns of Vernon Co. Wisconsin." The Monroe County Newspaper index has grown by 16,000 entries, including thousands more from the Monroe County Democrat, Tomah Journal, and Cashton Record. There are more than 231,000 newspaper articles abstracted from Monroe County's newspapers from the 1850s to the 1960s. Go to www.MCLHR.org to begin searching. Rural School Census Index Now Available! Where did your ancestor go to school? This database is an index of School Censuses filed in Monroe County for rural schools and village schools (note: City of Sparta and Tomah schools are not indexed here) between 1930-1950. Censuses were taken at the end of the school year. Information recorded for "children between 4 and 20 years" in that district includes name, age, date of birth, parent name, address and gender. School information recorded within the form includes school name, district number, township name, key school board members, and any teachers. School Censuses can be a useful tool to learn an individual's birth date, residence, siblings, and custodian when otherwise not available. Currently, five years of censuses are indexed here (1930, 1935, 1940, 1945, 1950). Indexing the censuses continues. Go to www.MCLHR.org to begin searching. --People of the Big Voice: Photographs of Ho-Chunk Families by Charles Van Schaick, 1879-1942, by Tom Jones, et al. And remember, every purchase from our online gift shop provides direct support for the Local History Room. Thank you! Your ability to find ancestors living in Monroe County, Wisconsin just improved greatly with the addition of the 1920 Federal Census Index. Our volunteer team just finished indexing the 1920 Federal Census for Monroe County, WI. The 1920 Census Index joins the other Federal (1860-1910) and State (1855-1885) Cenuses previously searchable via www.MCLHR.org. Census indexes found on the Local History Room's website are created by people who LIVE in Monroe County and have ancestors from Monroe County. We've found that our transcription accuracy is much better when compared to other online census indexes. So, even if you have already searched Ancestry.com's 1920 census index, be sure to double check ours for your Monroe County ancestors. Just in time for Memorial Day arrives the Gravestone Cleaning Kit--everything you need to safely clean up to three gravestones. Your ancestor's gravestone is covered with growth and grime. How do you safely clean it? Which cleaning materials are safest to use? The Monroe County Local History Room has partnered with Save Your Stones, a professional, western Wisconsin-based gravestone cleaning company, to offer the Gravestone Cleaning Kit. The Gravestone Cleaning Kit provides you everything you need to safely clean up to three gravestones. The Gravestone Cleaning Kit contains all of the proper tools necessary for cleaning gravestones safely and efficiently. No wire brushes, no metal scrapers, no colored plastics. Just preservation approved products. The Kit provides enough gravestone detergent to clean up to three gravestones. Approved by professional conservators, this non-ionic detergent is safe for stone, safe for your skin, and safe for the environment. The Gravestone Cleaning Kit includes "tools of the trade" that are proven to quickly and safely remove the growth and grime from the worst of stones. You just need to add water-and "elbow grease." Kit includes: spray bottle, poly scrub brush, denture brush, plastic scraper, wood pick, non-ionic detergent, and cleaning instructions. The Monroe County Court Record index grew by 8179 entries. Hundreds of Civil and County Court cases from 1930s-1970s are now searchable via www.MCLHR.org. In June 2009, 66 boxes of Circuit and County court records arrived at the Local History Room. Like the first batch of records released by the Clerk of Court in 1990, the State Historical Society selected key cases to be housed at the Area Research Center in La Crosse. Every case in this batch,including those sent to the La Crosse ARC, have been indexed and are searchable using the "Court Records" index on our website. These are civil cases only. "Indomitable Pluck: One Railroad, Three Tunnels, And America's First Rails-to-Trails Bike Path" by Karen Parker just arrived in the History Room Gift Shop. Although hundreds of thousands of bikers and hikers have enjoyed the Elroy-Sparta Bike Trail since it opened in 1966, few know the history behind this unique 32-mile stretch of old Chicago and North Western rail bed. Indomitable Pluck reconstructs the story of the people who drilled three tunnels and forged a path through the rocky hills of Wisconsin's Driftless region, forever changing the local pioneers' lives. Dozens of historic black and white images. 99 pages. 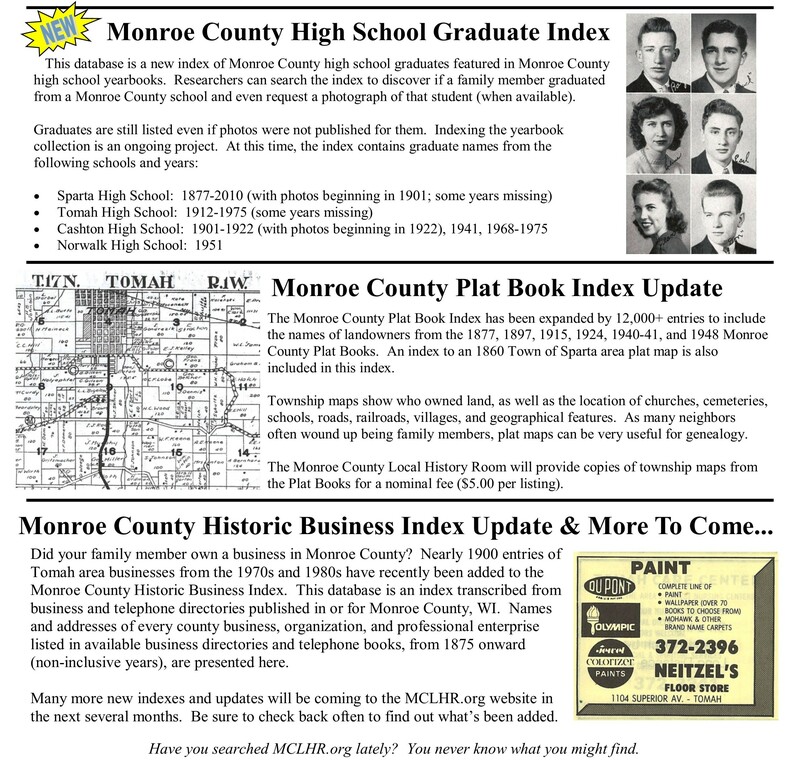 The Monroe County Newspaper index has grown by 19,000 entries, including thousands more from the Sparta Herald, Monroe County Democrat, Norwalk Star, Cashton Record, and Kendall news from the Elroy Tribune. There are more than 215,000 newspaper articles abstracted from Monroe County's newspapers from the 1850s to the 1960s. 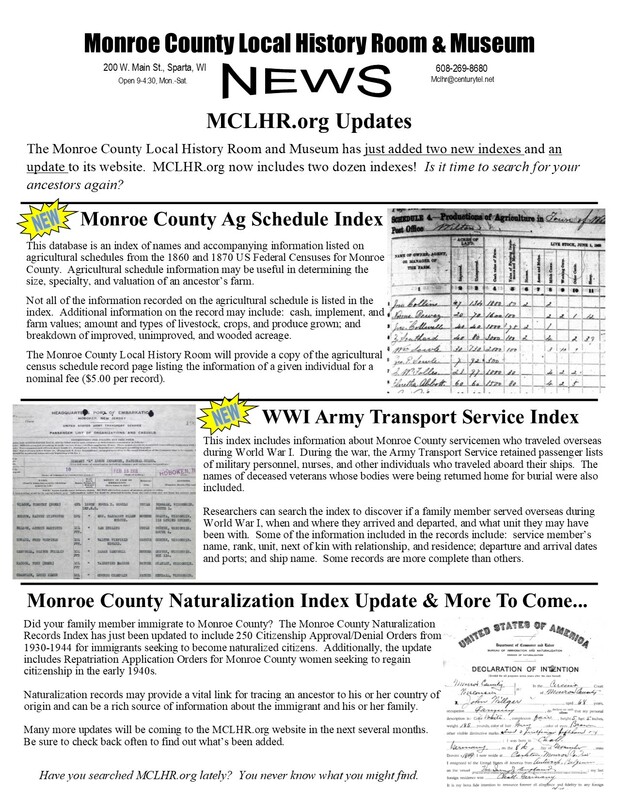 The Monroe Co Local History Room has just added its latest index to www.MCLHR.org - the Monroe Co. Birth Index (1850s-1944). This database is an index of births registered with the Monroe County Register of Deeds that occurred 1850s to 1944. In the early 1900’s, WI started requiring the reporting of all births. By 1907, the laws were strongly enforced and all Wisconsin Counties mark this year as the start for a thorough accounting of the births. Included in this index are births from this time period that are filed in Monroe County’s Miscellaneous Volumes. The index was created by the Monroe-Juneau-Jackson Genealogical Workshop (MJJGW) and updated by volunteer Charles Lautermilch for use on www.MCLHR.org. Copies of pre 1907 birth records can be ordered via the website. More updates to www.MCLHR.org are coming soon! Birth Index is coming to MCLHR.org! Soon you will be able to search for Monroe County Births via our website. You’ll also be able to request copies of Birth Registrations from 1906 and older! It takes 5 seconds to sign up and MCLHR will NEVER sell nor share your email address with any other group. We've added some new books and historic DVDs, so be sure to give it a good look over. You'll notice that we've separated the books into two catagories: History Books and Genealogy Books. Your feedback makes a difference! We've made two changes to our online search engine that should make your research even easier. Newspaper articles and other items may now be purchased using your credit card or PayPal account. Simply choose "Pay using Credit Card or PayPal." You may still pay via check if you like. Paying by credit card requires an easy registration to PayPal. It costs nothing extra, actually saves you postage, it's safe to use, and you get your order quicker! The second change we've made to how you search simplifies the "get copy" button. When you click, "get copy" of a particular item from the list of results, the "get copy" button will change to, "Item in cart." To see your shopping cart or to check out, simply click on the "Item in cart" box. These changes were made due to feedback we've received from website users. We thought they were good suggestions so we’re trying them out. We hope these changes make using our online search engine an even more enjoyable experience. This is a trial period for having the "pay via credit card or PayPal option." Please click the, "Leave Feedback" button and let us know what you think about these changes. New on www.MCLHR.org: “Wisconsin National Guard Lists of Persons Liable for Military Duty, Autumn, 1862"
This new index containing nearly 3000 names of Monroe County men living in the county in 1862. Original document contains the names, age, occupation and marital status of Monroe County men available for military service during the Civil War era. Search this index using the "Library & Genealogy Quick Search" box. Stay tuned for news about more updates and addition to our online index! The Local History Room just purchased 27 more rolls of Monroe County newspapers on microfilm. Donations from users of this website helped fund the purchase. The Sparta Herald, Monroe County Democrat, Tomah Journal, and Tomah Monitor Herald have been brought up to December 1993. At $80 per roll, the Local History Room is slowly bringing its microfilmed newspaper collection up to present day, acquiring more as funds allow. The History Room thanks those who made $5, $10, or $20 donations when ordering articles from this website over the past two years. The Local History Room receives no county funding for library materials or operating costs--your contributions have made this purchase possible. While it will be quite some time before these microfilmed newspapers are indexed, they are immediately available to any researcher wishing to view them or want a specific item copied (such as an obituary). Last month, an audience packed the Local History Room to watch the premier showing of “Are You Ready? A Civil Defense Emergency Training Film.” Created by then Civil Defense Director Gordon Stelter and filmmaker Don Goodman, this 20 minute film portrays real-life disasters as emergency response teams race to the rescue from Norwalk to Sparta to Tomah. You can obtain your own copy of “Are You Ready?” by visiting or writing the Local History Room. DVDs of this historic film are available for $12.50. Please include $2.00 postage for each copy. The Local History Room is located at 200 West Main St., Sparta, WI 54656. Special thanks to Dennis Burek, Experience Works Volunteer, for transcribing Gordie Stelter’s story. For the first time in almost four decades, a public viewing of the now historic film, “Are You Ready?” will be shown at the Monroe County Local History Room on Thursday, March 18th at 7pm. The film “Are You Ready” was created by Don Goodman for the Monroe County Office of Civil Defense in 1972 to demonstrate how to set up a Civil Defense operation in case of major emergency. This historic film was originally shot on 16 mm film but was transferred to DVD in 2008 in a preservation project sponsored by the Monroe County Local History Room. Mark Davini of Western Technical College and Jay Choutka of Gundersen Lutheran Medical Media Dept. provided special technical restoration assistance. At the March 18th film showing, “Are You Ready?” creators Don Goodman and Gordon Stelter will provide a special introduction to the film and share behind-the-scenes stories about its creation. The Local History Room is located at 200 West Main St., Sparta, in the former Masonic Temple. Call the History Room at 608-269-8680 for more information. When one hears the words “Old West,” several images spring to mind. From cowboys to Native Americans to gunslingers to saloon girls, people around the globe have a definite and largely shared vision of the West. But this image is not based on the purely historical realities of the lives of people who lived in the nineteenth-century West. Mass media and popular culture have shaped our understanding of the “Old West” through literature, stage, film, radio, and television. While this image is often steeped in myth, the myth itself has become important and helps Americans define who they are, or at least who they wish they could be. Dr. John T. Grider, Professor of History at UW-La Crosse, will give a presentation on the “‘Old West’-Media Myths and Historical Realities” at the Monroe County Local History Room on Thursday, February 25th at 7pm. The Local History Room is located at 200 West Main St., Sparta, in the former Masonic Temple building. Free admission. Call 608-269-8680 for more information. New on the LHR website www.MCLHR.org is a short video tutorial about how to best use the search engine on the website. Be sure to check it out (it's only 6 minutes long) as you may learn tips or tricks with getting results when researching using the "Library & Genealogy Quick Search Box." We've just fixed the Search Function for the Historic Image & Photo search. Before this fix was made, many of the people in the 6000 historic images on our website www.MCLHR.org were unidentified. We're pleased to announce that the names have been re-attached to the photos! Try typing the names of your ancestors in the search engine again. You may have better luck in your search. The Monroe County Local History Room team has been cataloging the thousands of paper artifacts in its collection for the past several years. These paper items, from diaries to historic maps, were only available to search using the computer catalog at the Local History Room. We are excited to report that thousands of these cataloged items are now available to search using the Monroe County Local History Room website. Just type a keyword or name in the “Keyword” box of the “Library & Genealogy Quick Search” box to search this collection. Items cataloged in this database include: family histories, diaries, business records, vintage catalogs, invitations, greeting cards, maps, ephemera, civic and fraternal group records, and so much more! The "Historic Image & Photo Archive" on this website just grew by several thousand pictures! Be sure to search it thoroughly for historic images of Monroe County people, cities, villages, events, buildings, landmarks, businesses, disasters, homes, schools, and so much more. Just plug in the name or search term in the "Keywords" box. High-quality prints are available to order, starting at only $3.00. Newspaper & Census Indexes updated & More! >Newspaper index has grown by over 26,000 entries, including thousands more from the Sparta Herald (1854-1969), the Norwalk Star (1903-1933), Cashton Record (1900-1914), and for the first time the Kendall news from the Elroy Tribune (1881-1888). >Inventories to several small Monroe Co. cemeteries have been added to the online index. With all of these updates to the website—BE SURE TO SEARCH FOR YOUR ANCESTORS AGAIN! --Burials at Saint Mary's Ridge Catholic Cemetery, Cashton WI (about 700 -- some have no markers). --Herman RICHTER "GEDCOM" file (data about many pioneers and their families from Monroe and Barron counties). To purchase a copy, please send a check to the History Room for $16.96 ($14.95 plus $2.00 s/h) to "Local History Room, 200 West Main St., Sparta, WI 54656." “The Haunting of Sparta” is 101 pages long and contains numerous black and white images. Copies of this book are available to purchase for $14.95 during normal office hours. Several new useful printed indexes and research books are now available through the MCLHR Gift Shop. Just click on the "Gift Shop & Resources" button on the left of this page and you'll find over a dozen newly listed publications provided by the Monroe/Juneau/Jackson Genealogical Club, a sister organization to the Local History Room. One item of note is the NEW publication, "Index to Monroe County Deaths: 1907-1968." We've just added a new function to this website--the ability for you, our web user, to give us your feedback on the website. We want to know what you think about the site. What about the website do you appreciate? What can make it better? Any great finds about your ancestors from using this site? We want to know! Just click the yellow "Give Feedback" button found under the "Quick Search" box. Help us make this website the best research tool possible for finding YOUR Monroe County ancestors. Available for the first time on DVD is the 1951 film documenting Sparta’s monumental Centennial Parade. Revisit Sparta of yesterday by watching this vintage film taken of the 1951 Centennial Parade in Sparta. Enjoy the nostalgia as you view dozens of floats rolling down Water Street, each one sponsored by a local business or organization. In full color and narrated by WKLJ personality Bill Erin. Any fan of Sparta will enjoy this wonderfully preserved film available for the first time. This DVD includes bonus insert listing all parade entrants and special reprint of a Sparta newspaper article recapping the parade. This historic film was originally shot on 16 mm film as a project sponsored by the Sparta Chamber of Commerce. The film was transferred to DVD and copies were made in 2009 in a preservation project sponsored by the Monroe County Local History Room with assistance from Jay Choutka of the Gundersen Lutheran Medical Media Department. The Centennial Parade is one of two films preserved on DVD. The second film, “The History of Sparta: A Sesquicentennial Celebration, 1851-2001,” is a video created by the Sparta Sesquicentennial Committee in 2001 in recognition of the city’s 150th birthday. Over 1 hour long, this historical retrospective of Sparta features memorable historic images and insightful commentary about Monroe County’s Seat. Copies of this double-feature DVD are available to purchase through this website for $14.95 each. Just click the "Gift Shop & Resources" tab. 1915 Monroe County Plat Book now indexed! DEATH RECORDS now available thru this site! The Local History Room Library now has a new workstation for the Minolta Microfilm reader/printer thanks to cookbook purchases and donations from the Monroe-Juneau-Jackson-Genealogical Workshop. The workstation replaces an old, green metal table that served as a make-shift workstation. LHR has been selling cookbooks created and donated by the Monroe County Title Company of Sparta since April 2008 to raise money for the workstation. 100% of all cookbook sales went toward the purchase of this new microfilm reader workstation, raising $200.00. The remaining $150.00 needed to pay for the workstation came from the Monroe Juneau Jackson Genealogical Workshop. MJJGW had received memorial money contributed on behalf of the late Gerald Thiemke and Geri Schlosser. Both were closely associated with MJJGW and the Local History Room for many years. Additional contributions to the workstation came from a number of MJJGW members. The Local History Room thanks everyone who purchased a cookbook, along with the Monroe County Title Company of Sparta and MJJGW, for improving the research library through the purchase of this workstation. The microfilm readers are available for patron use during normal library hours and can be used to view microfilmed documents, records, and newspapers. Cookbooks are still available to purchase at $10.00 each. 100% of cookbook sales go toward research material acquisitions. including thousands more from the Sparta Herald (1854-1969), the Norwalk Star (1903-1924), and for the first time the Cashton Record (1900-1908). Directories now cover 1875-1976; Tomah covers 1915-1960; plus County Gazetteers from 1894-1910. *As always, you can search for your ancestors in these indexes using the “Library & Genealogy Quick Search” box. Interested in Fort McCoy history? Have any relatives that worked or trained there? The new book “Images of America: Fort McCoy” features 128 pages of Fort McCoy photos, maps, and illustrations documenting the important military landmark for nearly a century. The book is available through the Local History Room for $19.99 each. Call 608-269-8680 for more information. The Local History Room is excited to announce a new opportunity to update library equipment. On sale now are new cookbooks created by Monroe County Title Company of Sparta. 100% of all cookbook sales goes toward the purchase of a new microfilm reader workstation! library space. The recipe book contains 70 pages of delicious recipes contributed by Monroe County residents. The patrons, volunteers, and staff of the Local History Room thank you! New Indexes are here! Plat Maps, Naturalizations! More! The Monroe County Newspaper index has grown by 15,000 entries, including thousands from the Sparta Herald, Monroe County Democrat, and for the first time, the Norwalk Star newspaper (1907-1912). You'll be able to search for your ancestors in these indexes using the Library & Genealogy Quick Search Box. 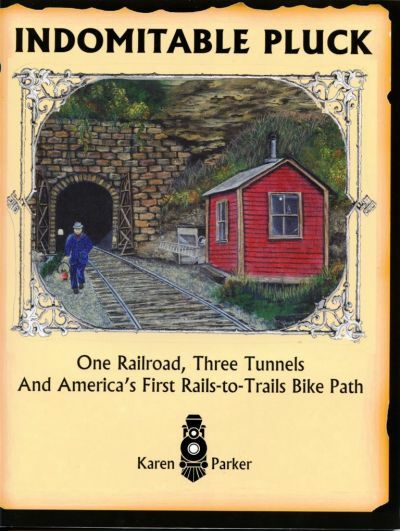 Available for the first time on DVD is the 1967 film "Elroy-Sparta Bike Trail: The Old Railroad Trail.” Take a visual tour of the Elroy-Sparta Bike Trail when it first opened 40 years ago. "Elroy-Sparta Bike Trail: The Old Railroad Trail” was created by Don Goodman for the Monroe County UW Extension in 1967 to promote the nation’s first rails-to-trails bicycle trail, running from Sparta to Elroy. This 15 minute, color film takes the viewer on a nostalgic tour of the bike trail from Elroy to Sparta and all points in between, including stops in Wilton, Kendall, and Norwalk. The city of Tomah, Monroe County cranberry country, Mill Bluff State Park and Wildcat Mountain State Park are also promoted in the film. Tomah radio announcer Del Lunquist narrates the film. Railroad history buffs will appreciate catching glimpses of remnants of the former Chicago Northwestern Railroad that have long since disappeared. This historic film was originally shot on 16 mm film but was transferred to DVD in 2006 in a preservation project sponsored by the Monroe County Local History Room. Copies of the DVD are available to purchase through the Local History Room for $12.50 each. Please send $12.50 plus $2.00 s/h for each copy to: Local History Room, 200 West Main St., Sparta, WI 54656. Call 608-269-8680 for more information. The Naturalization Records Index slated for posting at the end of November has been delayed because...we are making it even better! It was originally going to be an index of Monroe County Petitions for Naturalization and some Declarations of Intent, but a new Local History Room volunteer has come forward to transcribe the names from the Monroe County Certificate of Naturalizations! These names will be added to what will be known as "Naturalization Records Index." We hope to have this and more posted to this website in January 2008. 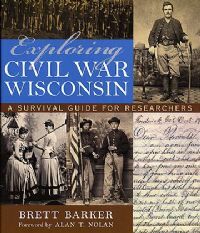 This NEW index contains a listing of Monroe County Civil War Veterans who either served in Wisconsin organizations (ie. regiments) or of other states living in Monroe County. Census years include: 1885, 1890, 1895, 1905. Use the "Library & Genealogy Quick Search" function to search this new database! This database is an index of biographies written for notable Monroe County citizens that were published in 19th and early 20th century books. Without this master index, one would have to peruse several books and risk missing some genealogical gold. Use the "Library & Genealogy Quick Search" function to search this new database! Senator John F. Kennedy passed through Tomah and Sparta in March of 1960 while he was campaigning for the presidency. This wonderful photograph was taken of JFK speaking in the Tomah Veteran Hospital's canteen on March 9, 1960. If you would like to order a copy of this print, you may request one through the mail. Prices are $6.00 for a 5x7 and $9.00 for an 8x10. Please include $3.00 for shipping/handling. Over 450 Historic Images Added to This Website! The "Historic Image & Photo Archive" on this website just grew by several hundred pictures. Be sure to search it thoroughly for historic images of Monroe County people, cities, villages, events, buildings, landmarks, businesses, disasters, homes, schools, and so much more. Just plug in the name or search term in the "Keywords" box. Our Newspaper Index just grew by thousands of entries. The Newspaper Index on this website now includes the EARLIEST surviving Sparta newspapers: 1859-1860s (non-consecutive), and the Tomah newspapers from 1910-1919. Be sure to search your surnames again! "From Rails to Trails: Recalling the Origins of the Elroy Sparta Bike Trail"
Our huge, online Newspaper Index just grew by merging with it an index to Warrens and Valley Junction WI newspapers (1898-1901). Added to the Newspaper Index are 1700 news items indexed from the Warrens Index (WI), Valley Junction Settler (VJS), and the Valley Junction Advocate (VA). The articles indexed here mostly include birth, death, and marriage notices. Find out if your ancestors are listed in any articles indexed from these newspapers by searching for them in the "Library and Genealogy Quick Search" box. For those of you that are not too far from Sparta, we hope you can make it to the Local History Room Thursday, March 15th at 7pm for what is sure to be an interesting program. Ed Hill, former Special Collections Librarian at Murphy Library, UW-La Crosse, will give a presentation on the history of photography and how to date old photographs. Mr. Hill will provide a brief history of photography, beginning with the daguerreotype, and discuss the evolution of techniques and styles. He will also provide clues on the dating of photos, clothing styles, photo imprints and cases, and the culture of the formal portrait. He will also discuss the importance of "association;" that is, the absolute importance of keeping together things that have stored together. Breaking up albums or collections is risky. The fact that two or three images have been filed together in an album or a letter is a vital clue to their association. This proximity is important. As time permits, Mr. Hill will discuss briefly how to store and care for photographs, and the significance of changing technology, especially digital photography, in taking and storing contemporary images. Sound interesting? Be sure to join us Thursday, March 15th at 7pm at the Local History Room. The Local History Room has its own web site! For the first time ever, your Monroe County Local History Room has its own web site. Be sure to check out each section of the web site to get the most from this valuable online resource. A selection of historic Monroe County photographs are available to view and purchase on this web site. We'll be adding more historic images to the online library periodically, so be sure to check back often.